Falafel is a traditional and a very popular Middle Eastern food. It is a deep-fried ball or patty made from ground chickpeas, fava beans or both. It is commonly served stuffed in a pita with lettuce, tomatoes and tahini. Falafels are also served on a salad or with hummus and tahini. It may also be eaten alone as a snack. Today we will learn how to make falafel following this easy recipe with step wise pictures. Wash and soak chickpeas overnight. Drain the water from the chickpeas and keep it ready. Grind chickpeas along with onion, garlic, coriander leaves, cumin seeds, coriander powder, salt, pepper powder and cayenne pepper. Do not add water. If your blender refuses to budge, you may add just 1-2 tsp of water. Grind it coarsely. You may adjust the seasonings as per your taste. Add flour and mix well. Do not add too much flour. I added just 1 1/2 tbsp of flour and I was able to make patties. Make balls and flatten it to form patties. Falafel is a deep fried snack but to make it healthy I have shallow fried it. Heat oil in a pan and shallow fry the patties on low heat on both sides until golden brown. Repeat the same process for the rest of the patties. 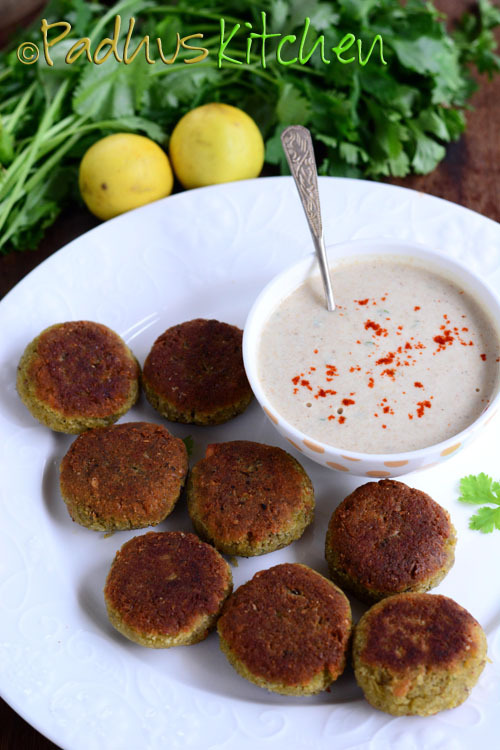 Enjoy falafel hot with Yogurt tahini dip (recipe below). Grind coriander and garlic to a smooth paste. Whisk yogurt, add the coriander + garlic paste, tahini, salt needed, lemon juice and mix until smooth. Refrigerate for 30 minutes. Serve with falafel. How to make tahini - Toast sesame seeds but do not brown it. Blend it with olive oil. The consistency should be thick but of pouring consistency. For more details, check my hummus recipe. Note - The falafel mixture may appear loose but once you start shallow frying it will hold together. In case, if you are unable to make patties, add a little more flour. You can also refrigerate the mixture for 15-20 minutes and then make patties. falafel looks great and shallow frying makes it more healthier. yumm..
Is it not necessary to pressure cook the chick peas? Can we bake this recipe ? If so, how ? Yes, you can bake but you will not get it dark brown or crispy on the outside. Tried it today with some remaining uncooked channa I had after making sundal. Was so yummy. I am a student living in Pittsburgh and a sincere fan of your blog. I owe most of my cooking glories to u. Thanks and keep more delicious stuffs coming!